What exactly are custom chopper forward controls? On a stock motorcycle, the foot pegs, brake and shifter controls are located just below the rider causing the rider to sit pretty much straight up and in a position that can get tiring after miles on the highway. Forward controls place the foot rest, brake and shifter in a forward position allowing the rider's legs to extend forward into a more comfortable seating posture. Now it is true that many people simply can't stand chopper forward controls, or forward controls on any bike for that matter. Many novice riders are not comfortable with the controls positions forward because they must move their feet to a position under them to prevent a tip over. However, not many novice riders are seen cruising on custom choppers. Chopper forward controls transfer the rider's weight forward which can improve handling somewhat. On the other hand, the forward control position tends to make the rider lean back putting pressure on the tailbone and lower back. After long hours on the road, this can result in lower back pain. Sitting upright can cause back pain on long trips as well, so it comes down to your choice of what control position is most comfortable for you. Dalton Designs offers soft tail forward controls for 1986 through 1999 custom choppers (pictured at right) that are show quality. Made from machined billet aluminum, the brake and shifter level have height adjustments. Hidden hardware secures the master cylinder cover, pivot points and foot pegs. These aftermarket parts fit most custom choppers in the year models listed above. Kuryakyn provides a forward control kit that fits in between the expensive billet controls and the less attractive low priced kits. A chrome shift level, ISO-shift pet, chrome brake pedal and ISO-brake pedal pad are all made from show quality chrome over steel. The four-point mounting system ensures secure, stable mounting. Oilite and Nylite bushings provide smooth operation. Choose the Super Deluxe kit includes a streamlined master cylinder cover as well as a cover that hides the plunger. 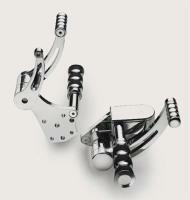 The foot pegs will accept any Harley Davidson male mount peg, but the peg is not included in the kit. If this kit is used to add chopper forward controls to Sporters with Harley Davidson engine guards, longer mounting bolts are required and are available in the Kuryakyn hardware line. For riders that are really tall, over six feet in height. a kit that extends the forward controls an additional three or three and one-quarter inches. This puts the controls in the most forward position possible. People who are not as tall will probably find this extension to be simply to much forward for comfortable reach. Mid-USA provides chopper forward control kits that are perfect for custom choppers. Three different kits are available that fit year models from 1973 to 1994. Some kits do require shifter linkage in addition to the kit for installation. Some include foot pegs while others do not. These are chromed, wide-pedal controls and a two inch extender kit is available for those who want the controls to be in a position even further forward.